Friday, January 25, 2013: Up and intended to hit the road early…..however, as happens so much during these adventures, we met an interesting couple that came wandering by. So there we stood in front of our fully hooked-up and ready to go rig for a few hours of enjoyable conversation. Jim and Carol are from Portege, Michigan and like us, escape the frozen north for some fun in the sun. Jim is a retired US Army Lt. Col. and a high school administrator. However, the thing that caught my attention and piqued my interest was the shirt he was wearing……emblazoned on the right front pocket was the emblem for the Kalamazoo Corvette Club. 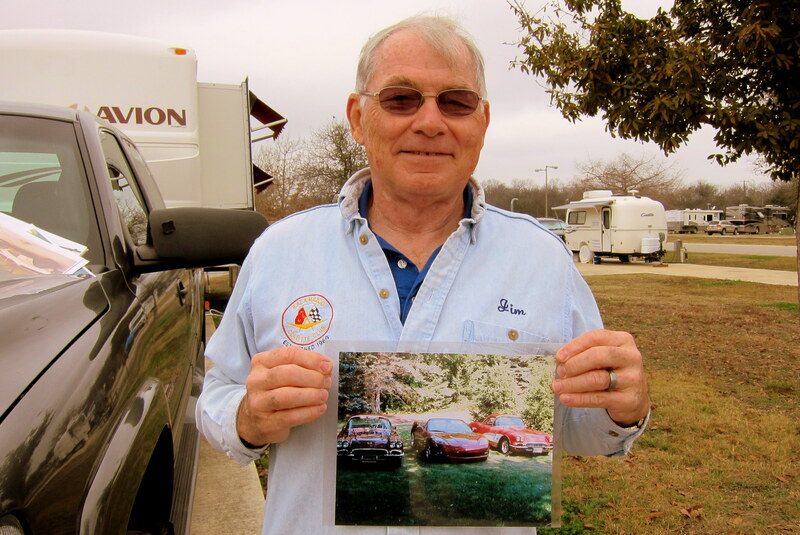 Not being content to own one of these fine American sports cars, Jim has three! A 1961, a 1962 and a 2006…..somehow that just doesn’t seem fair! He also has other classics and a few street rods in his collection. And a point of coincidence, one of his restorations is in the Wells Maine Auto Museum! So finally we are underway from Fort Sam Houston at 1200 under cloudy skies and a temperature of 73 degrees. Once again we decided to choose time and miles over exploration opportunities and jumped on I-10 heading west. Not much occurred over the next nine hours but the humming of tires on the long straight stretch of asphalt. Since we trundle along at 60 MPH and the speed limit is 70 MPH, many cars, trucks and joggers pass us by. Most are just plain old generic vehicles. However every once in a while something of interest comes roaring by…..like this nice Lead Sled. Also, already passed and now back in the travel lane in front of us is a nice 1966 Mustang GT. We try and stop every few hours to take a break and do some stretching and walking. Around midafternoon we pulled into a truck stop for fuel and exercise. Being a full service establishment, they featured all the trucker’s favorites. 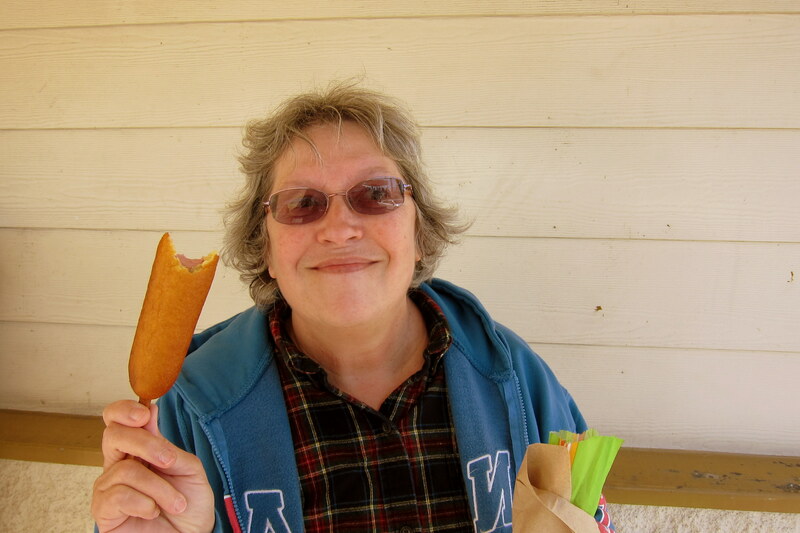 Kit couldn’t resist flying her Redneck Flag and devouring a Corndog. 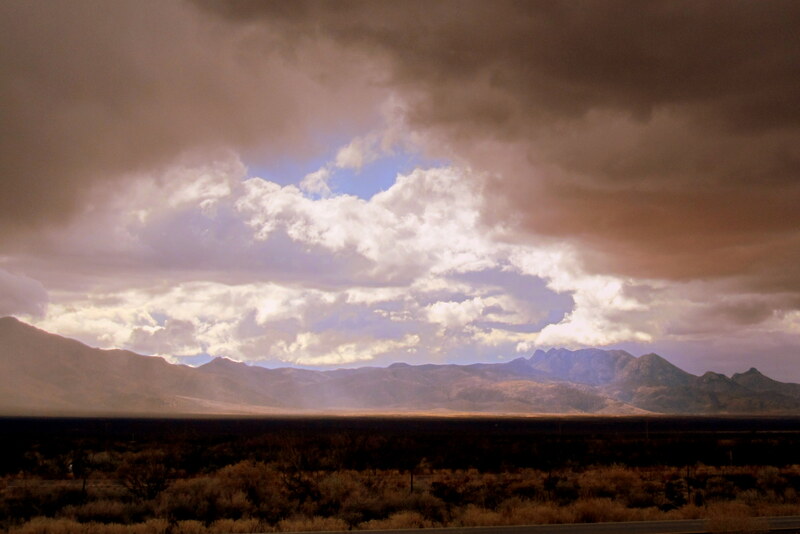 A few times during the afternoon, when the monotony of the Interstate got to us, we pulled off on I-10 Business. This parallel bypass left the highway, pierced a small town or two, and rejoined its mother road a few miles further down the line. See how exciting getting off the main highway in this part of Texas can be. 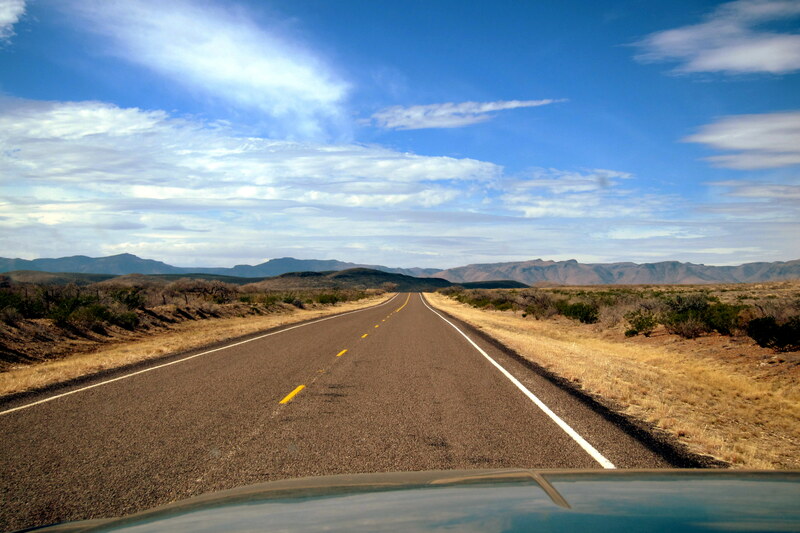 See why we stick to the interstates in this part of Texas? Kit could hardly contain her excitement. Oh, that black horse-collar looking thing she has around her neck is a “Prank Preventer”. You see, when I’m driving down the road and Kit nods off, I like to entertain and amuse myself by wiggling the steering wheel, causing the truck to weave a tiny amount, which causes Kit’s head to flop from side to side. Then, after tiring of that, I would pulse the brakes and cause her head to nod back and forth. However the real thrill was combining those moves so her head would make complete circles about her neck…..believe me that operation takes real talent! 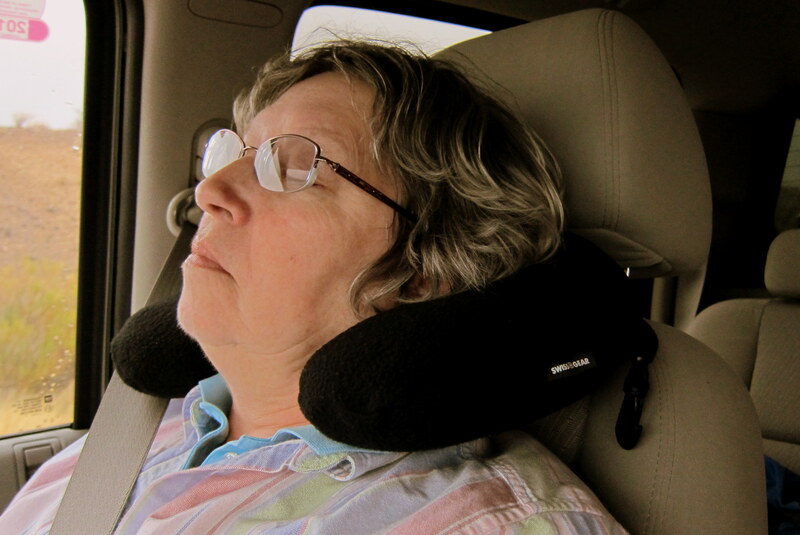 This fun diversion went on for many years before she figured out her sore neck upon awakening was Bill induced…..the head support pillow fixed the problem and ruined all my fun. Being on back roads, we have the benefit of enjoying some authentic roadside art. 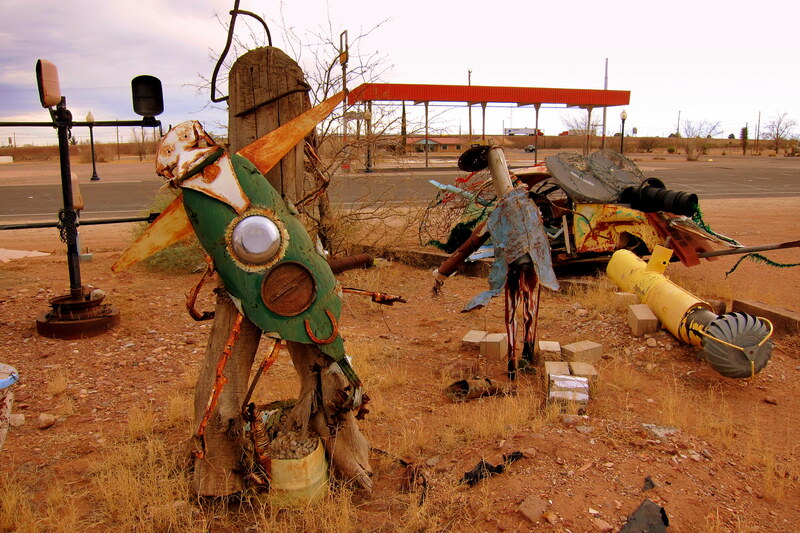 This creation was in front of an old dilapidated building just east of Lordsburg, NM. Sorry, Randy. 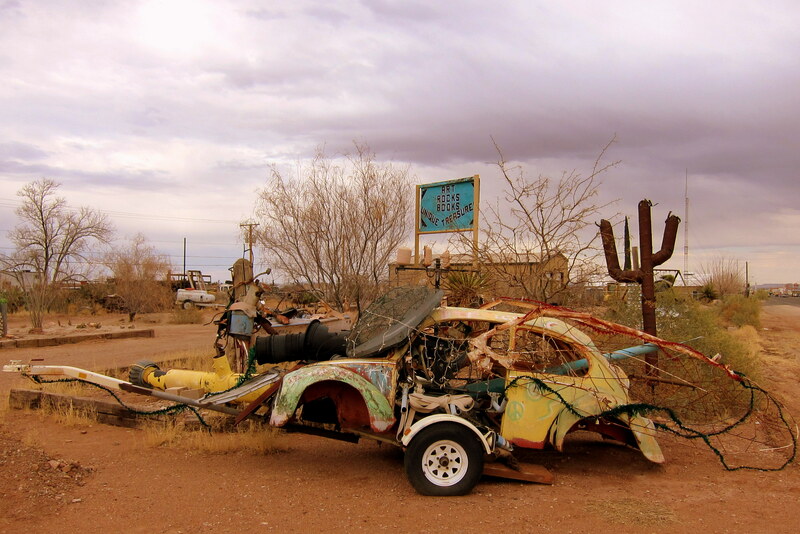 I agree…..what an ignominious end for such a fine automobile. Keeping the VW company were other fine objet d’art. It’s a wonder that such valuable art work is left alongside the road!?!? 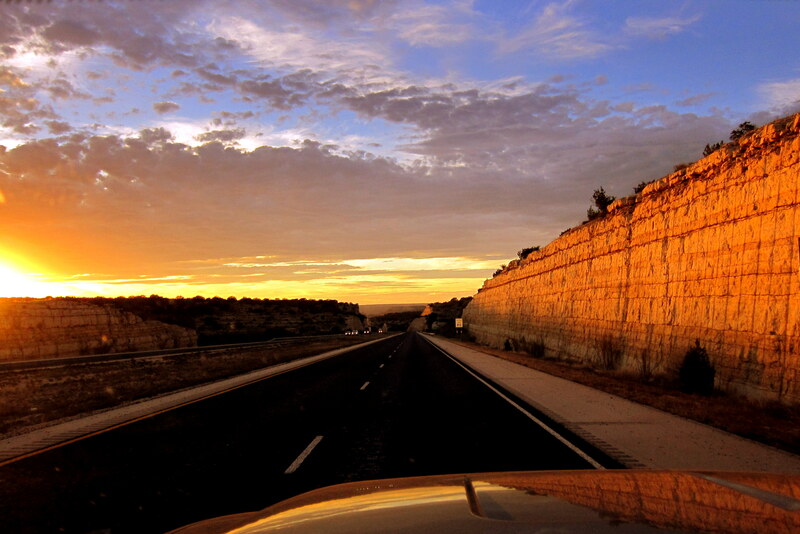 Back on I-10, as the sun set in the western sky, it illuminated the surrounding landscape in a golden glow. About this time of day, we generally stop for the night. 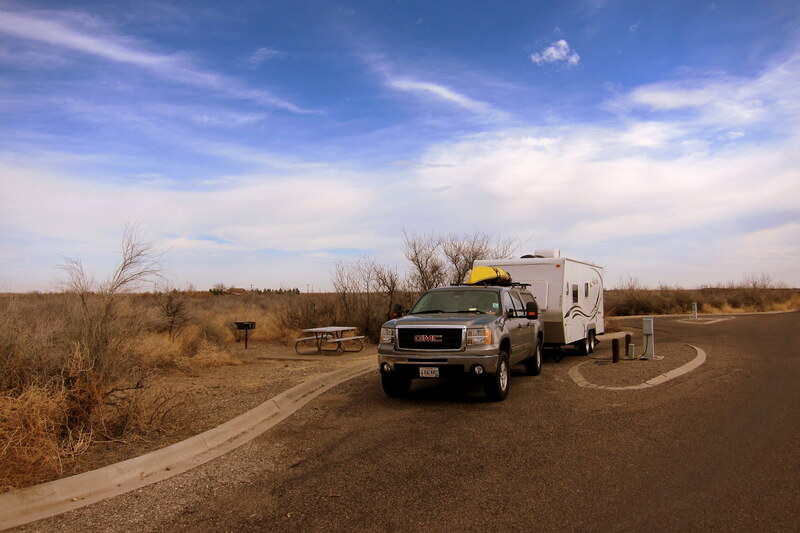 However we were within striking distance of Balmorhea State Park, one of many Texas State Parks that feature camping…..so we soldiered on. Our last stop before arriving at our destination was a roadside pull-off. 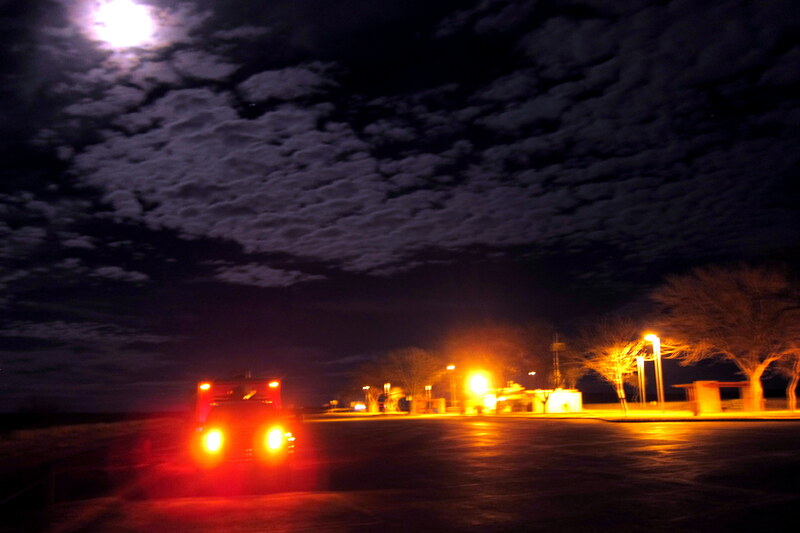 It was pretty dark, and the combination of the truck headlights, trailer running lights and full moon to the east made for an eerie image. Arrived at Balmorhea at 2050 and since it was way past the rangers office hours, we just selected an available site and set up for the night. Saturday, January 26, 2013: Woke to our first glimpse of the campsite and surrounding terrain. Not bad for a true “shot in the dark” I’d say. Since yesterday was a long and tiring haul, we decided to lounge about the campsite for a few hours. Balmorhea State Park was constructed by the CCC in the early 1930’s. To put folks to work during the depression 200 young men hand dug and covered with Limestone a 3,500,000 gallon pool which was filled by the San Solomon River. 25,000,000 gallons of fresh spring water flow through the pool every day making it a perfect swimming hole. The 74 degree crystal clear water provides a great facility for scuba divers to explore the 75 foot depths where they can observe two rare aquatic species…..the Comanche Springs Pupfish and the Pecos Mosquitofish. Yeah, I know……it sounds like a title for some bizarre sy-fy western but that’s the name of the fish. Having some free time from my hectic retiree schedule, I pressed my iPhone into service and looked for any Geocaches in the area. Turns out there were quite a few, one of which was hidden by the Texas State Park folks themselves. This cache had a variety of toy cars as tradable’s. Many still in their original bubble packs and likely placed there by park service personnel in order to entice youngsters to get off hand held video games and use their hand held GPS to get some exercise. 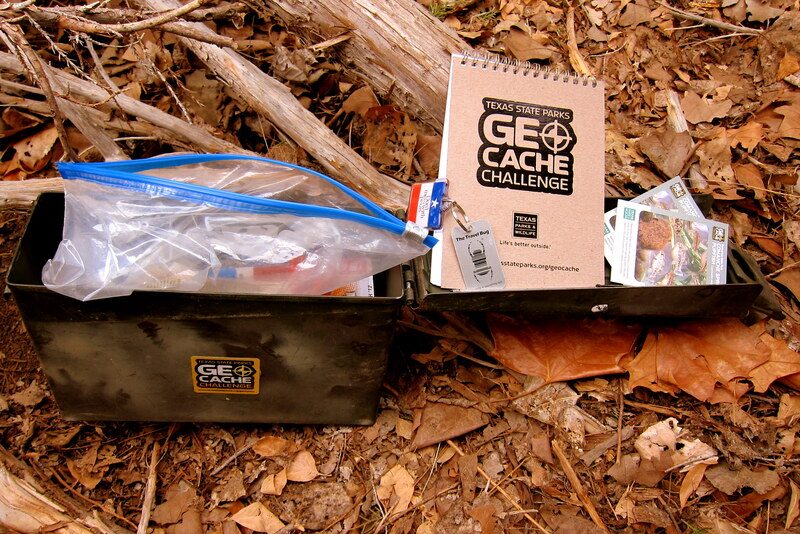 I didn’t have anything to trade so I just logged the find in the logbook and on Geocaching.com. Also in the cache was a dog tag shaped device called a “Travel Bug”. These metal tags are generally attached to a tradable, in this case a Texas key ring. Travel Bug’s are purchased and owned by a geocacher who establishes a goal for its destination, in this case Yellowstone National Park. Then finders are to move it along on its intended route by relocating the Bug to another cache closer to that desired destination. 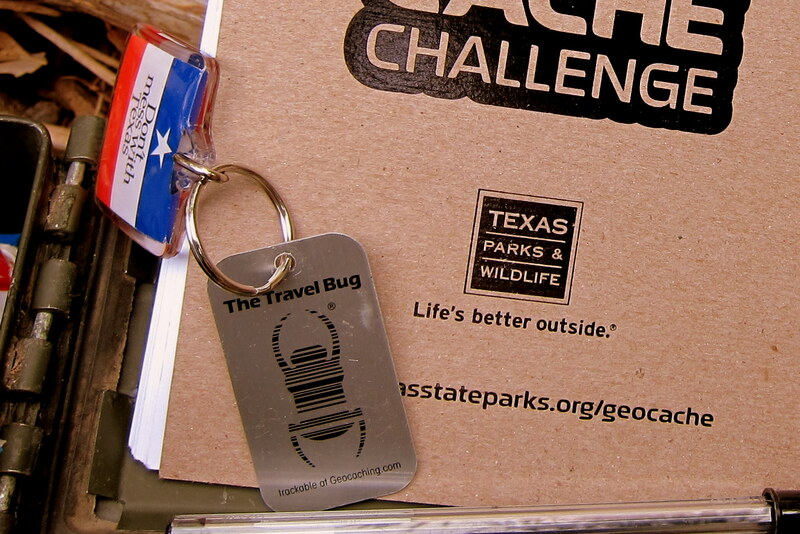 The metal tag has an image of a bug made of UPC lines and by scanning the code with your smart phone the Geocaching.com webpage of the Travel Bug’s owner will come up. Unfortunately I didn’t do this until later and now the Travel Bug is going west rather than north…..oh, well the innocent faux pas of the newbie. 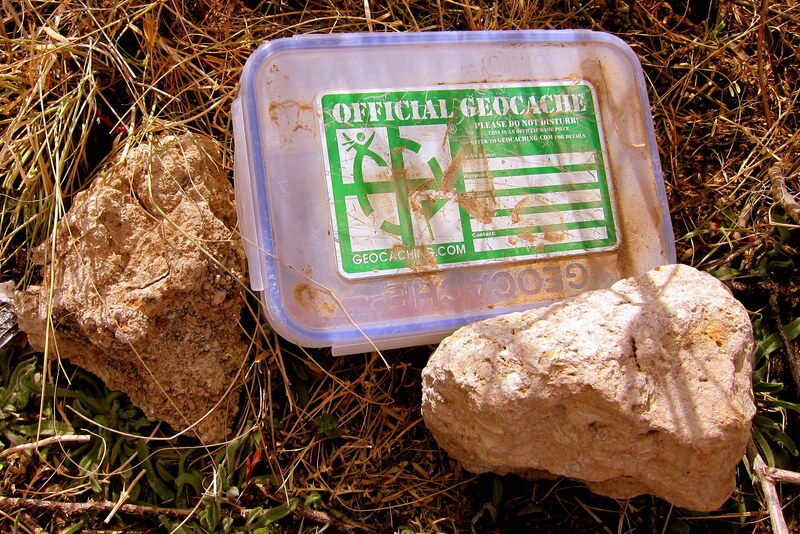 So, what now my learned fellow geocacher friends? While returning from my geocaching adventure I happened upon a campsite that was occupied by a unique RV with a unique license plate. So what does one do? Well unique up on it of course! 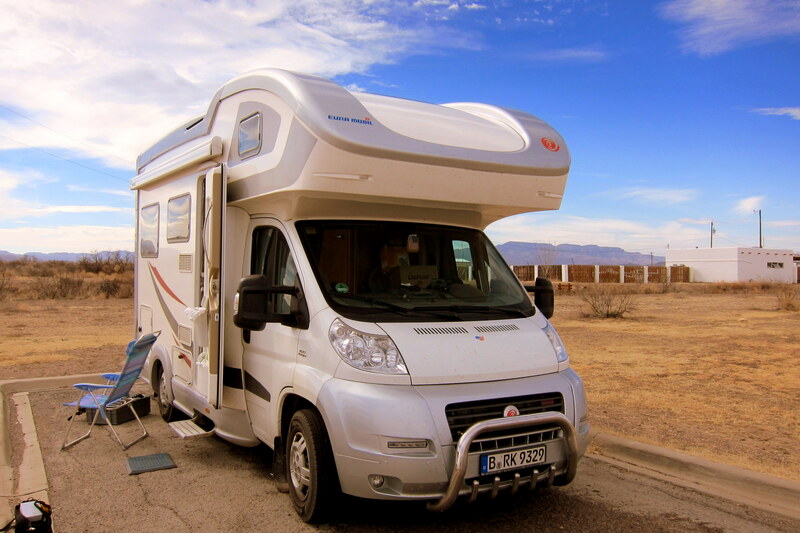 Turns out that the Class A motorhome is a Fiat and was shipped from Germany to Halifax, Nova Scotia last May by its owner. 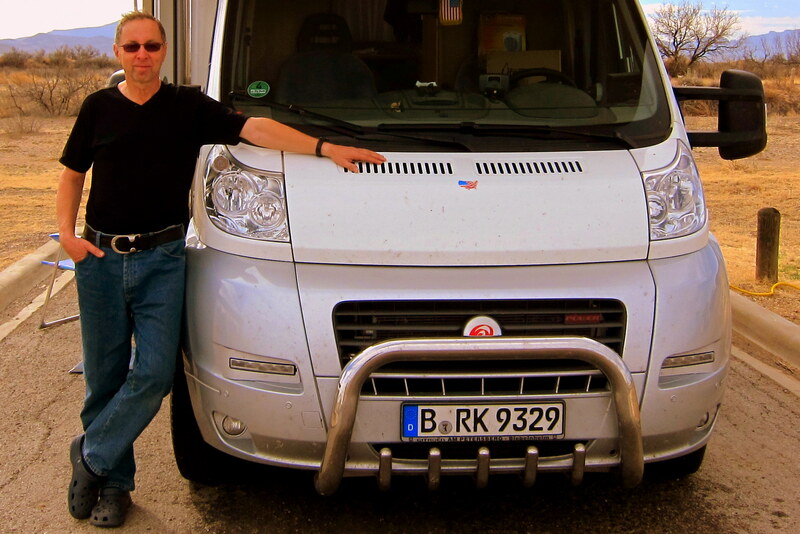 Rainer from Berlin, is on a post retirement North American RV trip and has been across Canada, visited Alaska and traveled down the west coast. His intention is to tour the south before exploring the east coast and then travel through New England before arriving back in Halifax for the voyage home…..pretty comprehensive trip I’d say. Rainer was a very interesting character, Kit and I enjoyed talking with him about Germany and America. We invited him to dooryard surf at our home in Maine…..sure hope he takes us up on the offer! Returning to our campsite, it was obvious that Kit needed some more quiet Kit time so I pulled out the old trusty iPhone and looked for another Geocache. This second one was a bit harder to find as the coordinates were a little off. So I conducted an expanding circle search (yea I know…..I’m such a geek) and eventually spotted the cache hidden under a cactus! 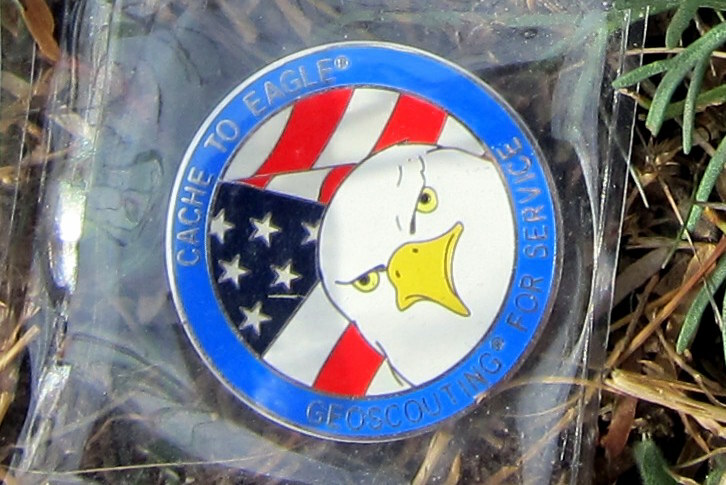 This one was placed by a BSA Troop from Eastern Texas and, in addition to the regular items, it also contained a Geo-coin, which is another form of Travel Bug. Its Eagle Scout owner want’s the coin to travel the US and promote the wonderful world of scouting. Logging the find on geocaching.com, I learned that the coin has traveled 15,343 miles so far but has only been in the western US and Hawaii. So in honor of my oldest grandson, an Eagle Scout as well, it is coming to Maine with me to see the other side of the country! 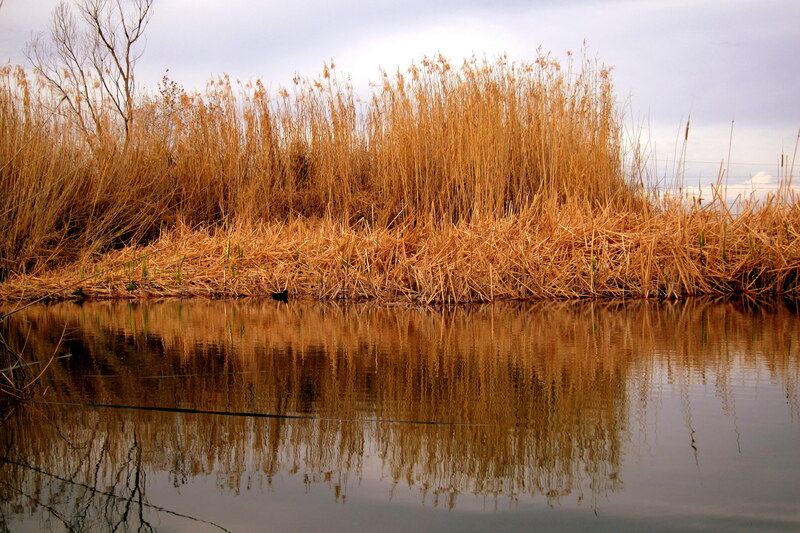 Another feature of Balmorhea State Park is a restored cienega, or wetland. Before the CCC dammed the San Solomon Spring and developed this area into a recreation facility, these wetlands were plentiful. Since the area is a haven for migrating birds the park service has channeled off some of the water to a low area that formally contained a natural cienega. According to the literature, this area is prime bird watching habitat and draws lots of birders during migration season. 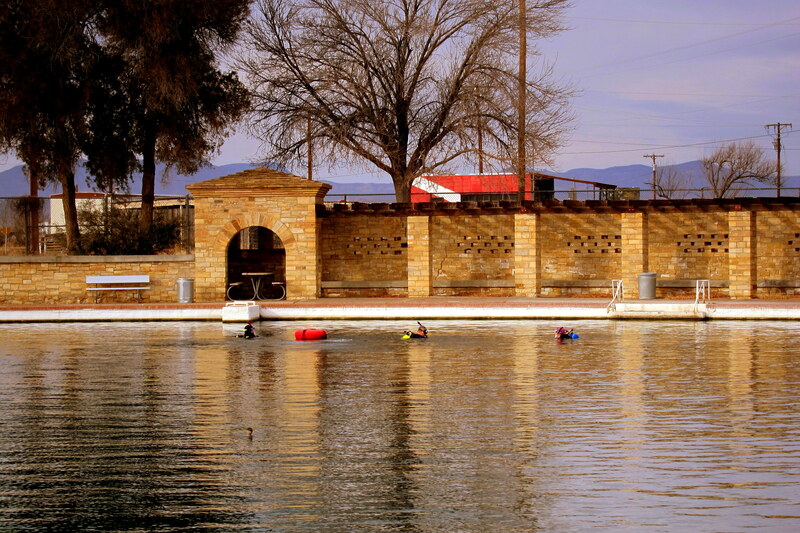 At 1240 we pulled out of Balmorhea under bright blue skies and temperatures in the upper 60’s. 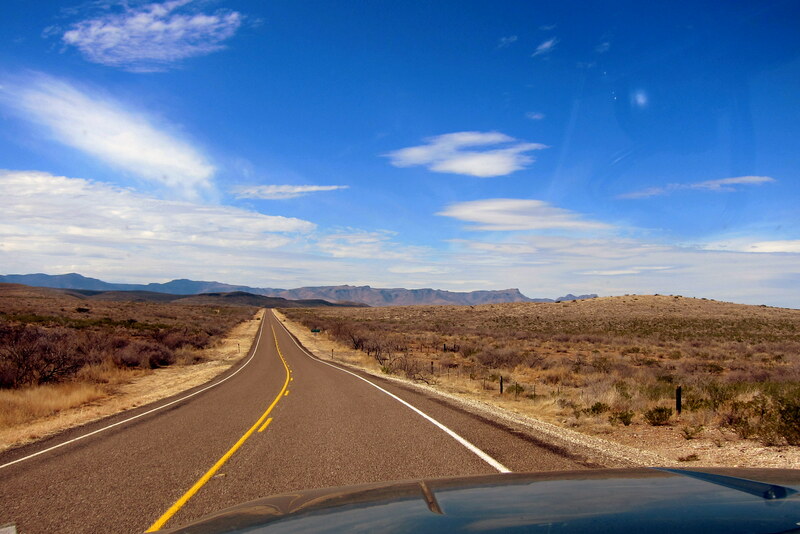 Then we continued to make our way westerly toward I-10 on a variety of back roads. 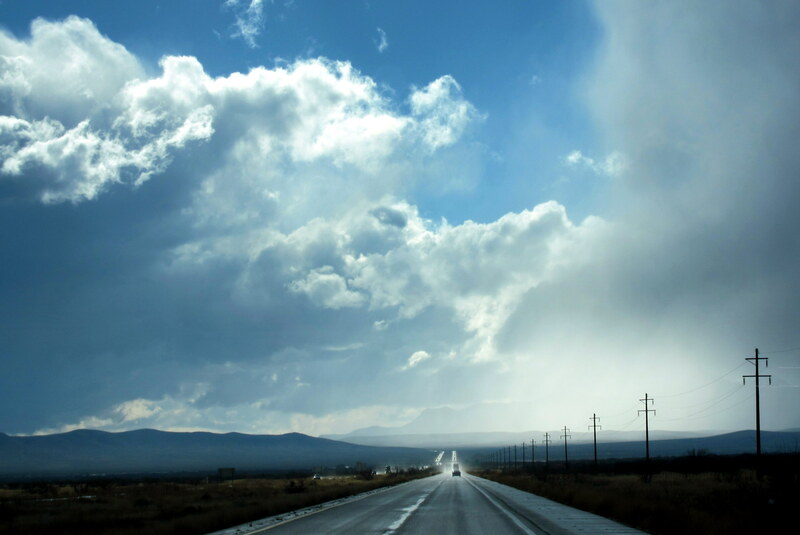 As you know, we so much prefer these types of roads for travel as they are sparsely used and far more scenic. However the reality and need of occasionally making better time forces us to take to the Interstates. 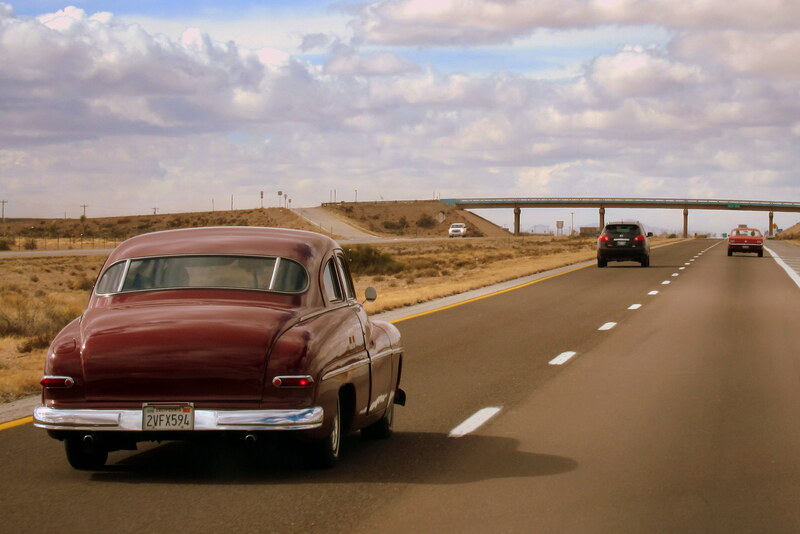 Within the hour we were on I-10 and making tracks for El Paso, Texas. At 1430 we crossed into the Mountain Time Zone and once again gained an hour…..which was the most exciting thing to happen since leaving camp. Kit called Fort Bliss and learned there were a few spots open in the campground so that is now our destination. At 1500, we arrived at the campground and set up for a few nights stay to take advantage of the internet connectivity, do some underway replenishment and take care of the pile of laundry. Laundry is a touchy subject. If you have been following these adventures at all, you will remember that I am forbidden to have anything to do with laundry…..I can’t even say the word in Kit’s presence. Apparently this has something to do with the great San Diego overstuffed washer flood of 2009. Sunday, January 27, 2013: Not much happened today. Monday, January 28, 2013: On the road at 0940, it is a sunny day and the current temperature is 67 degrees. 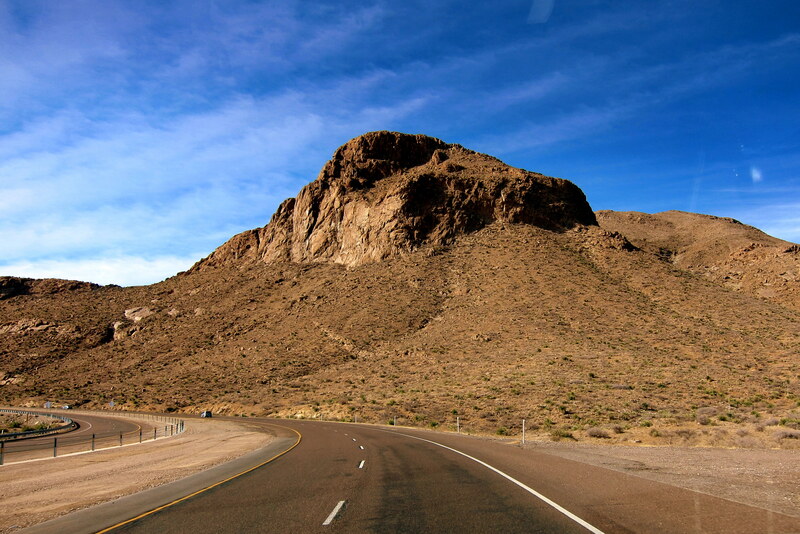 We decided to take the Trans Mountain Road just north of El Paso which goes up and over 7,000 foot Franklin Mountain. On the opposite side we once again encountered I-10 and headed toward New Mexico, crossing the border at 1008. 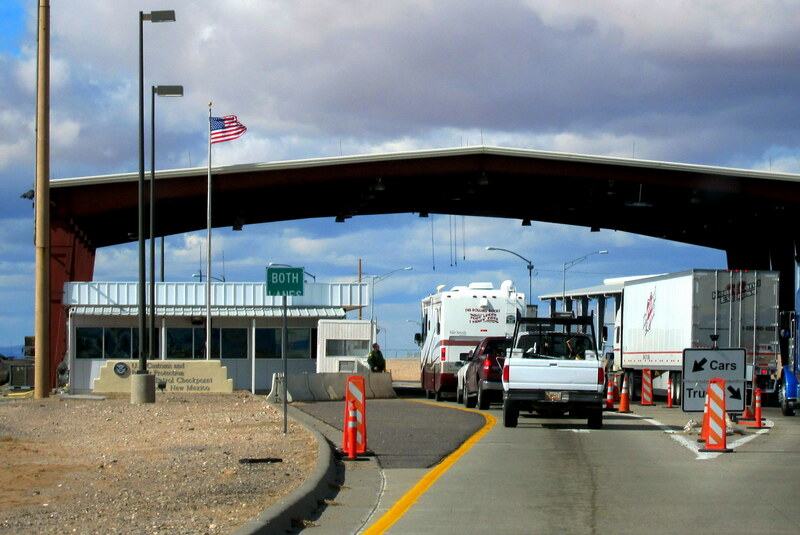 Shortly we encountered our first US Border Patrol Checkpoint. Kit started frantically rummaging about the various travel debris we cart around in the back seat of the truck while simultaneously lowering the side window. Asking what that was all about, she excitedly yelled “we need to chuck the oranges”! After calming her down and informing her that this wasn’t an agricultural checkpoint she started to relax. That is until this ominous sign appeared. 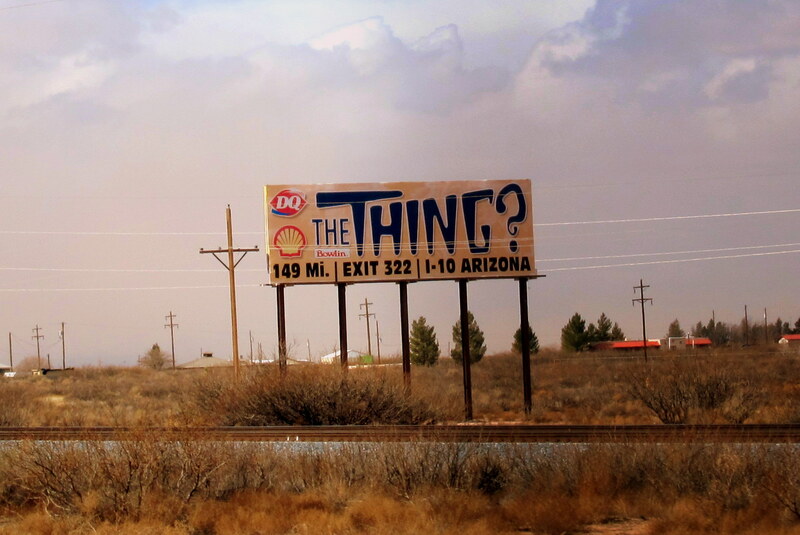 Yep, billboards advertising “The Thing?” start hundreds of miles before its actual location. We have blown by these signs for many years and also casually drove right past Exit 322 without batting an eye. However something compelled us to stop and see what all the hype was about. Only 149 more miles of anticipation remain! Within an hour, we noticed the temperature had dropped to the low 50’s. The skies became dark and ominous while the wind speed increased and the direction shifted to the southwest. It was a dark and stormy afternoon my friend. The wind was buffeting the truck and trailer bad enough that we pulled off in rest area to wait it out. 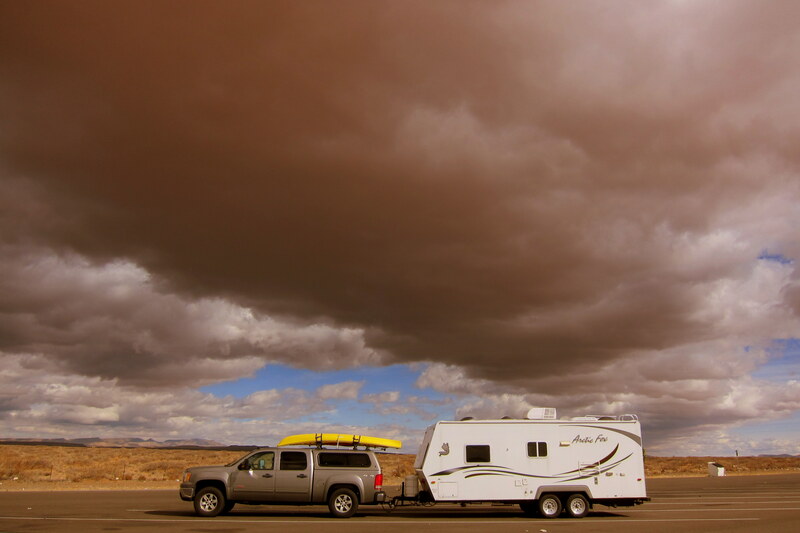 After a while the wind abated a bit and we decided to motor on and soon were crossing the Arizona border. Shortly thereafter the rains came…..torrential but not long in duration. In a few minutes we punched out of the storm and viewed better weather ahead. The proverbial “light at the end of the tunnel”! 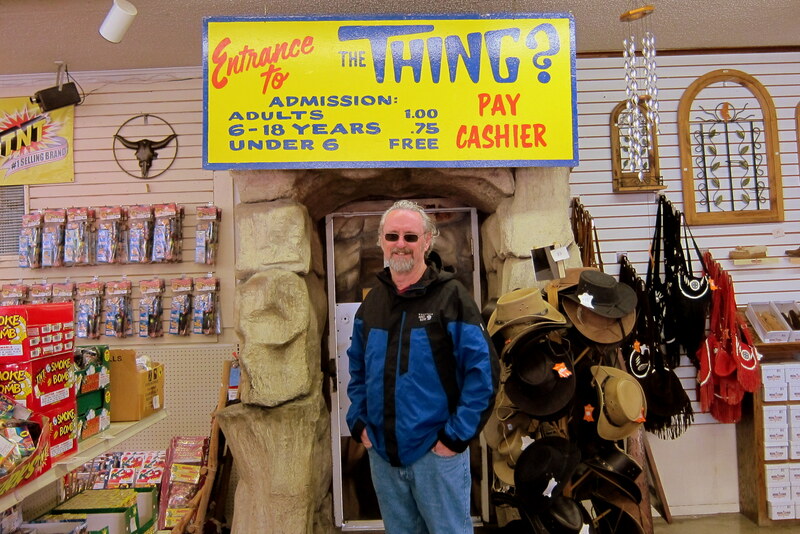 Not wanting to upset the local weather spirits, we pulled off the interstate at exit 322 and into the dooryard of “The Thing?”. Inside, we paid our $1.00 admission and entered The Thing?’s inner sanctum. Where we viewed The Thing? 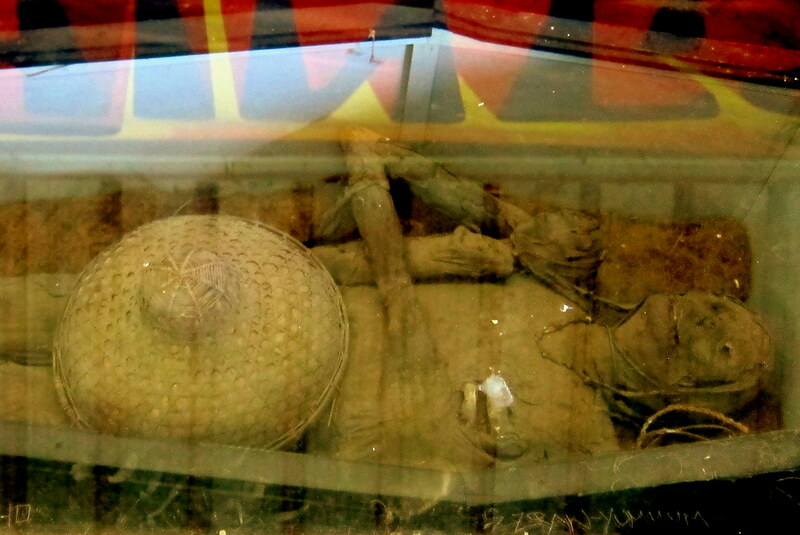 In all its mummified glory. Don’t ask about the placement of the straw sombrero and I’m not about to guess what the thing is that the “The Thing? has his right arm around! After our private audience with The Thing?, we knew the spirit gods were at peace as we departed The Thing?’s home to a glorious rainbow to the east. Once again, on the road westerly to a much anticipated family reunion with my 88 year old mom, my slightly younger than that brother, his much younger finance, and my little brother. Also one of the nicest camping opportunities we enjoy on these trips…..The Doobie RV Resort. Stay tuned for “Fun in the Old Pueblo”! 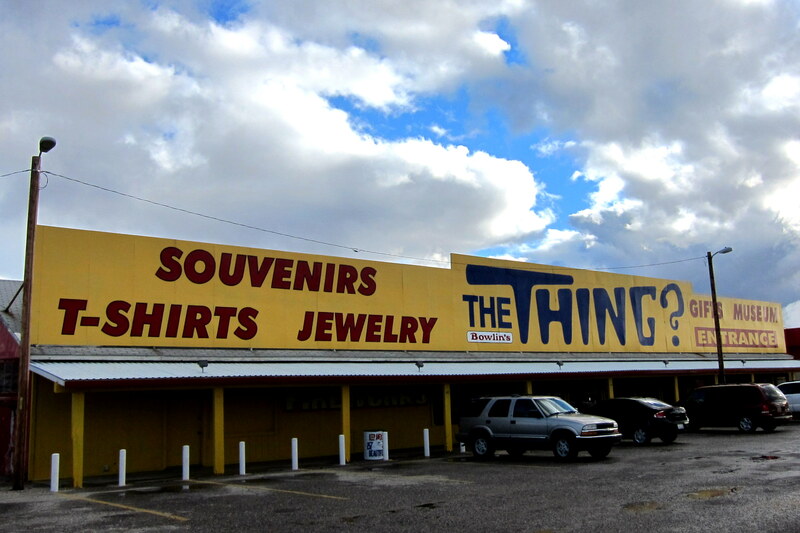 Kit’s Corner: It was great that we finally stopped to see “The Thing!” It’s been on our bucket list for maybe 40+ years. We’ve driven by it probably 20 times over the years. I’m glad we only spent $2.00 on it. I couldn’t even find anything worth buying in the huge gift shop. It was good to finally arrive at Dewey & Bea’s place and settle in for a few days. We went to see Nana each day and visit with her. As usual, she was happy to see us. BTW, the reason you see me dozing off while riding along is that my mapping services are no longer needed. Now that we have Lucille, she has taken over the task of getting us where we need to go. Occasionally, she takes us in circles for a while but hey, it’s good for entertainment value. The light at the end of the tunnel???? Why is everybody in New York depressed? Because the light at the end of the tunnel is New Jersry!! Ha, ha ha. We hope to see you guys if you make it to San Diego, looks like you’re having another great adventure this year, ya-hoooo!!! Trip going well, and we do plan to tag the left coast before moseying home. Hope to see you folks when we do. Sounds like you two are really making the progress. Do you think you will make it as far west as San Diego this year? Current plan is to hit the left coast soon…..hope to be able to see you folks while we are in town. Sorry you missed our 2-day blizzard and 2 feet-plus snow! Ah, winter in Maine in all of its’ glory……..
We were with you in spirit! 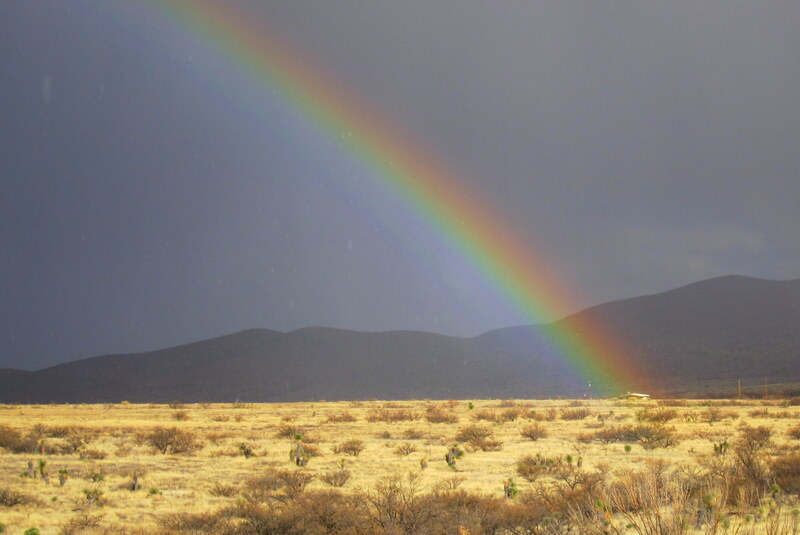 And besides, our temperature here in southern Arizona dropped from 78 degrees to a frigid 62 degrees…..overnight!! So we were suffering as well, my friend!!! Loving it…so many places bring back sweet memories of our few travels in that area.